"That terminator is out there. It can't be bargained with. It can't be reasoned with. It doesn't feel pity, or remorse, or fear, and it absolutely will not stop, ever, until you are dead!" An unemotional, stoic figure pulls into a suburban neighborhood and calmly walks up to the door of an apparently harmless woman. Without warning, the large man pulls out an automatic weapon and murders her with numerous gunshots. This act is nothing to this killing machine who only shows the appearance of a human being. Instead, this monstrosity (Arnold Schwarzenegger) is a terminator�a cyborg from the future whose only purpose is death. His target is young Sarah Connor (Linda Hamilton), a charming, apparently innocent waitress with no knowledge of her importance. The battle for the future has begun. James Cameron's The Terminator took moviegoers by storm in 1984 with its tenacious pace and intriguing science fiction premise. Arnold Schwarzenegger had not yet reached the level of megastardom, and Cameron had never helmed a major film before in his career. Although produced on a relatively small budget, this film contains visual effects and remarkable makeup that are still believable in today's complex computer-generated world. The structure is tight and precise, and few moments are wasted on character development. However, the foundation of its success is a believable love story that transcends the chaos. Backed by this important human element, the action carries tremendous weight due to the high stakes involved for the main characters. Sarah Connor's plight is not hopeless. The heroes of the future have sent courageous Kyle Reese (Michael Biehn) to fight against the apparently indestructible terminator. Although she scoffs at his ridiculous tale of a futuristic world destroyed by nuclear war, she begins to waver when she witnesses the terminator's remarkable survival skills. Sarah is essential to the future because her unborn son-John Connor-will lead the battle against the machines who have ravaged the world. Eventually, Reese and Sarah form a bond that transcends their problems in fighting the terminator. This connection carries the story and keeps things moving during the brief interludes between the action. It's also interesting to note the gradual change in Sarah's demeanor as the film progresses. At the beginning, she lives a fairly normal, innocent life with her roommate in a basic apartment. Her best friend is her lizard, and she could be one of millions of young women in cities across the world. During her battle to stay alive, Sarah reveals the true strength within that will make her a leader in the arduous days of the future. Although the human elements help the story, an obvious drawing point is the frenetic action sequences that grip you and refuse to let go. Schwarzenegger's terminator is a horrific creature because it has no conscience or emotional weaknesses to slow down its killing spree. Innocent victims mean nothing to this callous machine. In one memorable scene, he enters a heavily guarded police station and promptly dispatches an entire unit of cops without a second thought. The gloomy score perfectly conveys the incoming dread as he continues his deliberate march toward Sarah. Several energetic car chases provide chills through fast-moving and realistic direction that keeps the events simple and exciting. Although Cameron has directed more ambitious epics like The Abyss and Aliens, he's never been able to duplicate the sheer precision of his work in this film. Every shot and sound effect helps to create a mood of approaching evil that is difficult to ignore. Although this film often falls into the B-movie category of science fiction, it features impressive acting performances across the board that raise it above this perceived level. Schwarzenegger has seldom reached this plateau in his many successful films. His presence perfectly embodies the machine-like grace of the terminator. It utilizes few expressions or moments that are not absolutely necessary to achieve its goals. Linda Hamilton shines in a rare starring role for a woman in an action film. With the exception of Sigourney Weaver in Alien. Michael Biehn's career has often been relegated to supporting roles in big action movies, but he has consistently proven his acting mettle with impressive performances in The Abyss, Aliens, and The Rock. He plays Reese as a kind-hearted soldier who's spent a lifetime suppressing his emotions in a cold world. James Cameron, Arnold Schwarzenegger, and Linda Hamilton teamed up again in 1991 for Terminator 2: Judgment Day�the blockbuster sequel that raised the stakes and drew massive crowds to the theater. This epic story expanded on the foundations set by the first entry and juiced up the action to crazy proportions. The larger budget and new special effects allowed for jaw-dropping scenes of chaotic action. Although the overall result is impressive, this film lacks some of the heart and weight that carried the original story. Now there's talk of work on a third entry in the series without the direction of Cameron. One can only hope the creators will learn from the mistakes of films like Alien 3 and Lethal Weapon 3 and invent more original adventures for Sarah and John Connor to inhabit. Image Transfer Review: The Terminator features a wonderful 1.85:1 anamorphic widescreen transfer that is remarkable for a film released back in 1984. The gloomy nighttime landscape includes very little grain, and the action-packed events shine through with sparkling clarity. In the explosive finale, the bright fire jumps from the screen and adds even more energy to these tense moments. A few specks of dirt appear on the print, but they're extremely minor and don't hinder the experience in any way. This is a top-notch transfer and a major improvement for fans who were stuck with bad VHS versions. Audio Transfer Review: This disc includes a brand-new 5.1-channel Dolby Surround transfer that showcases a significant amount of power and depth. In the early moments, large ships fly right across the sound field from one corner to the other, and the effect is startling. While this track may not have the pristine complexity of the best DTS transfers, it works impressively and presents the action in full force. It also contains the original mono track, which lacks the strength of its companion but does have a balanced level of sound. Extras Review: This special edition of The Terminator contains an impressive collection of supplements that should please its many devout fans. While it falls far short of Artisan's Ultimate Edition of Terminator 2: Judgment Day, there's still some nice features on this release. The highlights are two well-done documentaries that provide plenty of background material. Other Voices is a comprehensive new extra that includes basically everyone involved with the film in a significant capacity. Containing a series of recent interviews with James Cameron, producer Gale Anne Heard, makeup wizard Stan Winston, actor Michael Biehn, and others, this feature paints a complete picture of this classic. It starts with the story's origins and moves through casting and filming while explaining the many obstacles they faced to make this picture. 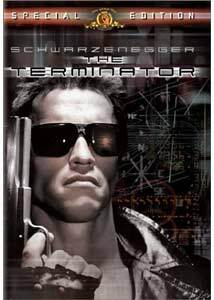 The Terminator—A Retrospective features an informal conversation between James Cameron and Arnold Schwarzenegger in 1992 about their experiences making the film. It's intriguing to hear two men responsible for some of the most expensive films ever made talking about the problems and silliness of working under an extremely low budget. This 18-minute feature covers some of the same items as Other Voices, but it's less comprehensive. One plus is more commentary from Schwarzenegger, who obviously played a major role in the movie's success. The other major inclusion is 7 deleted scenes that were more interesting than the usual throwaway moments. James Cameron offers commentary on each cut and tries to explain why he made the deletion. Although he likes most of the scenes, the story needed to keep moving and not back off too much to reveal character elements. They include a collection of extra scenes with Paul Winfield and Lance Henriksen's characters that gives them a greater role in the story. There's also a compelling moment where Sarah Connor takes over and decides to change the future. This plot point was removed for tightening purposes but later resurfaced in Terminator 2: Judgment Day. These are all decent scenes and would have worked in the story, but their deletion makes sense in keeping the movie short and energetic. There's also a large still gallery that contains numerous drawings and photographs in five categories. The most interesting section includes artwork by James Cameron of his original concepts and storyboarded sequences. There are also the usual behind-the-scenes photographs and shots of events in the film. The collection of publicity materials is significant, with plenty of silly photos of the terminator. This disc also offers fans a chance at reading James Cameron's original film treatment. Written in 1982, it's very extensive and includes the basic structure for the final version. DVD-ROM users may print this treatment and several versions of the script from their computer. The option also is available to compare scenes from the film to these original texts. This release also includes several original theatrical trailers and television commercials. Each trailer comes in a mediocre 1.85:1 widescreen transfer with foreboding narration describing the basic plot. Easily the best of the three is the foreign version, which gives away less and creates more interest. James Cameron has drawn large audiences to the movie theaters with easily enjoyed entertainment like True Lies and Titanic. While these films are definitely reaching audiences, they miss the sheer energy created by his work in early pictures like The Terminator. Amid his silly posturing at the Academy Awards®, it's easy to forget that he helmed one of the best science fiction pictures of all time. Forget his recent work and check out MGM's special edition of this remarkable film.